You’d probably eat your burger with your hands, and maybe the fries and pickle, too. But fingers just won’t do when it comes to cole slaw, and the kind of fork you use depends on where you’re eating your lunch. 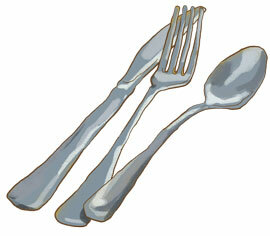 In a diner, it might be part of a group of mismatched flatware made of steel or even plastic. But if you’re using real true silver, someone designed and maybe even handcrafted it. If you’re lucky enough for that to be the case, then silversmith John Cogswell, age 58, makes the flatware that you might use to eat in a very grand style, indeed. “When I was 18, I went out of high school directly into undergraduate school in Cortland, where I grew up, not having a clue what I wanted to do. I’d known, all of my life, that I was attracted to things artistic, but I grew up in a world that said, if you can get a job working in a factory, then you’re set for life. But I had other ideas. “After taking a class in jewelry making my second semester, I set up a small studio in my attic and tried to teach myself as much as possible. The only book I could find was, by today’s standards, a laughable little Sunset Press publication called Step-By-Step Jewelry by Thomas Gentilli, who is now an internationally famous jeweler. But that book, even though very simple, was my bible. Every night, when I would get home from my day job, I would sit there and pore through and study those pictures before I went to sleep, trying to figure out how everything was done. “I often take pieces home, and put them on my nightstand and play with them in the dark...you know, the click of a box or a latch or clasp that works just perfectly...I can’t describe it to you! And, in the middle of the night, my ever-patient wife would kind of chuckle and say, ‘Are you playing with that thing again?’ Still, to this day, I’ve never lost that thrill. “I hate polishing, though. Novice metalsmiths, be they jewelers or silversmiths, can’t wait to get on the polishing machine: they want to see the glint of metal. And it’s a real charmer at the beginning, but then after a while you learn it's filthy, dirty, rotten work. But it has to be done, very carefully and very accurately, otherwise you undo all of the work that you’ve put into it at that point. 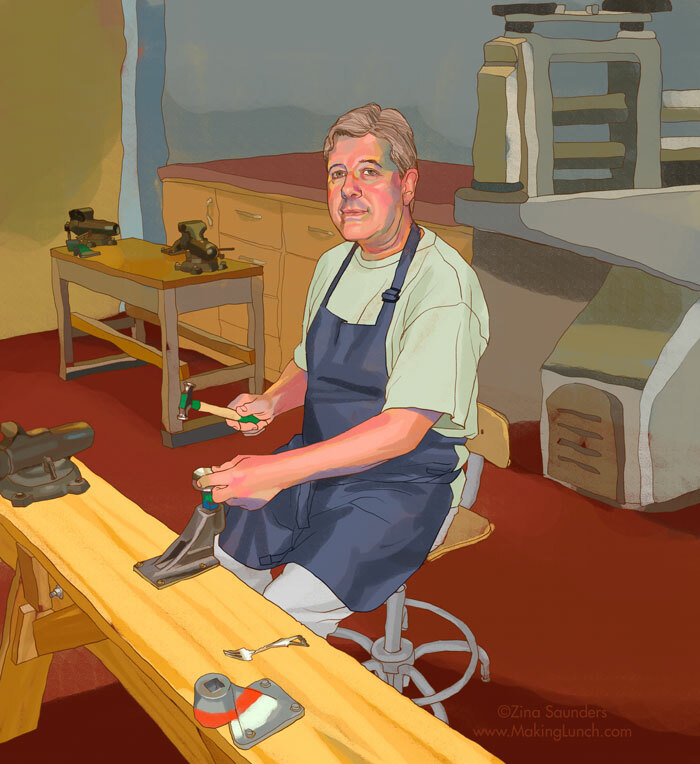 So, I’m an expert polisher but I hate it.